MAAC - Items wanted or for sale: Baretta 92FS Chrome - CO2 (air) Pistol. Baretta 92FS Chrome - CO2 (air) Pistol. 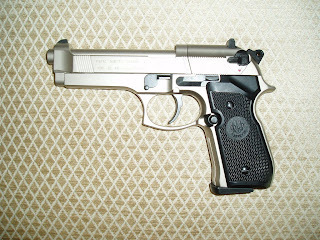 Newly purchased Beretta 92FS Chrome CO2 (air) Pistol. - Cal 0.177 air pellets. Including Case, cartridges and pellets. Owner got airsoft crazy and wants to sell. € 85 or nearest offer. Registered will only sell to TS-B (airgun) licensed persons.